This all inclusive dinner at Cinderella's Royal Table features a specially created Chocolate Slipper Dessert, an engraved Glass Slipper in which the ring is presented, champagne flutes and more. Requires 7 days advance notice: Call (407) 824-4477 or email [email protected] for pricing, details and proposal arrangements. 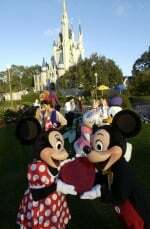 Another choice is to contact the Walt Disney Florist at (407) 827-3505 where a Dream Maker will be happy to assist you with ideas to make the moment memorable. Visit them on the web at DisneyFloralandGifts.com. Cinderella Castle is a wonderful backdrop when proposing and there are always Disney photopass photographers close by. Want to avoid having a bazillion strangers in the background of your photo? Head to the castle and go to the photo spot on the right. You'll have a railing behind you instead of other guests. There's a similar spot in front of The Crystal Palace restaurant. Choose one of the special Valentine's Day events that have been planned especially for the romantic occasion! It's always twilight when you dine at the San Angel Inn inside Epcot's Mexico Pavilion. Watch the cheesy horror movie clips while dining "under the stars" at the Sci-Fi Dine-In Theatre. Relax in the outdoor hot tub of your Deluxe Resort or better yet, stay at a Disney Vacation Club Resort where the one/two bedroom units have the hot tub in your room. Most of the resort gift shops sell more than postcards. You can often find a selection of wine that you can enjoy in your room. You can also purchase wine at the World Showcase in Epcot. (Just make sure you can open it.) Pick up some chocolates while you're at it and you're all set. Splurge on a once-in-a-lifetime meal at Victoria & Albert's. Instead of using the buses or water ferry from Disney's Hollywood Studios, walk along the water's edge to the BoardWalk. While at the BoardWalk, act like a kid again while playing carnival games. You may be lucky and win your sweetie a stuffed toy. You can rent a Surrey Bike built for two to cap off your day. Surprise your significant other by adding the Enchanted Evening experience to your Walt Disney World vacation package. 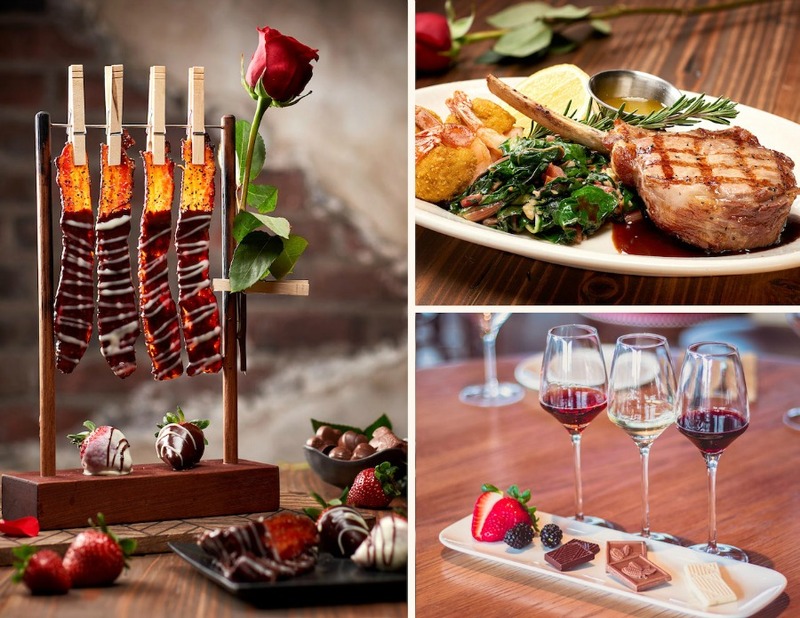 The magic of Disney dining brings romance to the table with special Valentine’s Day prix fixe menus that include optional wine pairing, themed desserts and drinks at select restaurants at Walt Disney World Resort hotels. Couples can share unforgettable meals at some of the swankiest restaurants on property such as Narcoossee’s and Cítricos at Disney’s Grand Floridian Resort & Spa, Yachtsman Steakhouse at Disney’s Yacht Club, California Grill at Disney's Contemporary Resort, and Jiko at Disney’s Animal Kingdom Lodge. 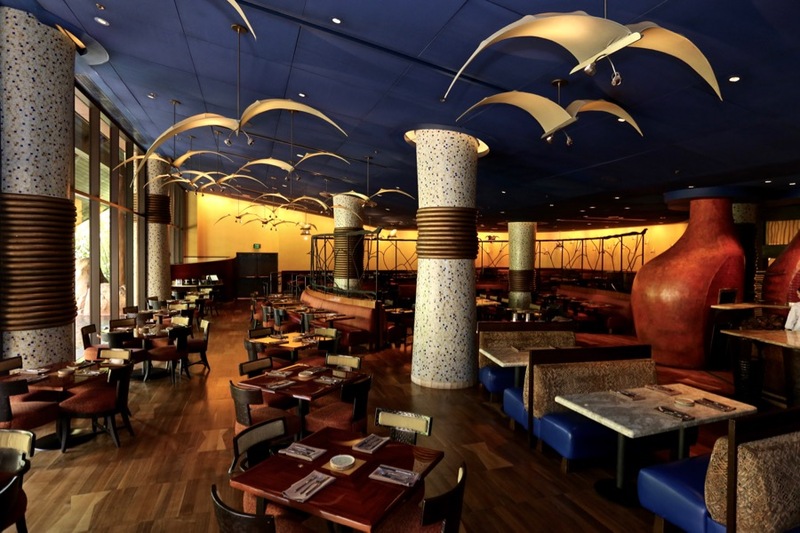 Disney Springs restaurants such as Maria and Enzo’s, Enzo’s Hideaway, Morimoto Asia, The Edison, STK Orlando, and Wine Bar George are all planning special menus just for the occasion. Reservations are strongly encouraged and can be made by calling (407) WDW-DINE. *Receipt must be dated February 14, 2019. Offers subject to change without notice. Restrictions apply. See locations for more details. 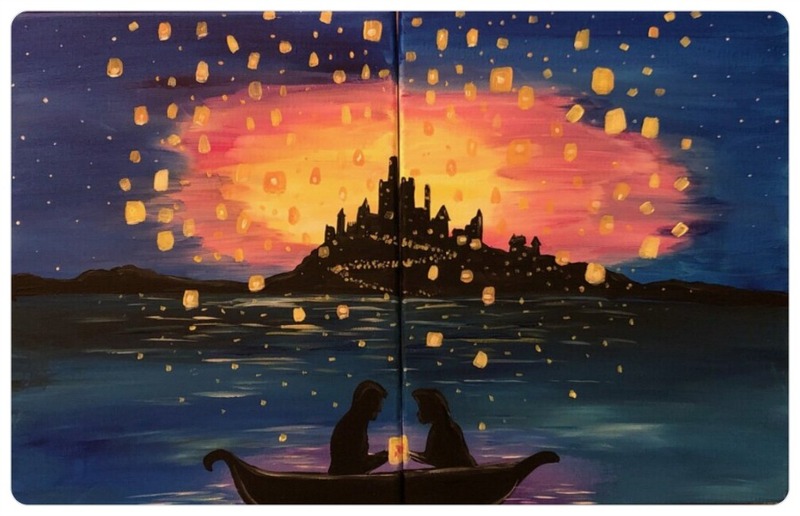 A special offering allowing guests to create a Tangled-inspired masterpiece with their Valentine at Disney’s BoardWalk Inn is available on February 14 only. This event will be held from 4-6:00 p.m. on the large terrace off the lobby. A minimum of 2 people is required per reservation and the cost is $50 (plus tax) per person. Snacks and beverages will also be served. Guests wishing to book this experience should call (407) WDW-PLAY to book as spaces are limited. Unique Gifts: You'll find jewelry, home décor, beauty products, skincare, and more at the shops at Disney Springs. 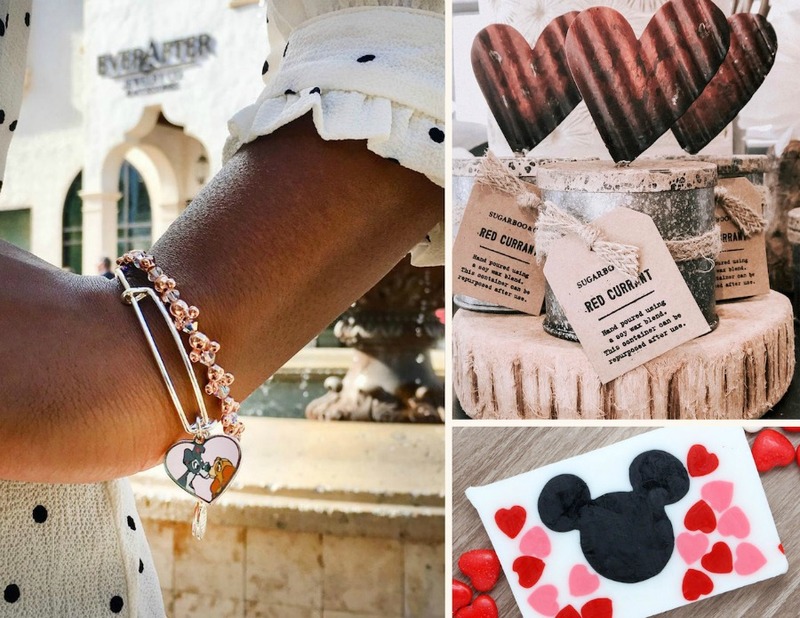 If bling is on the list for your Valentine, stop by Ever After Jewelry Co. & Accessories where you'll find all kinds of ALEX AND ANI bangle. If something decorative for the home is more up your alley, Sugarboo & Co. has some of cutest home décor. Basin’s Valentine’s soaps have arrived in lovely shades of red and pink. 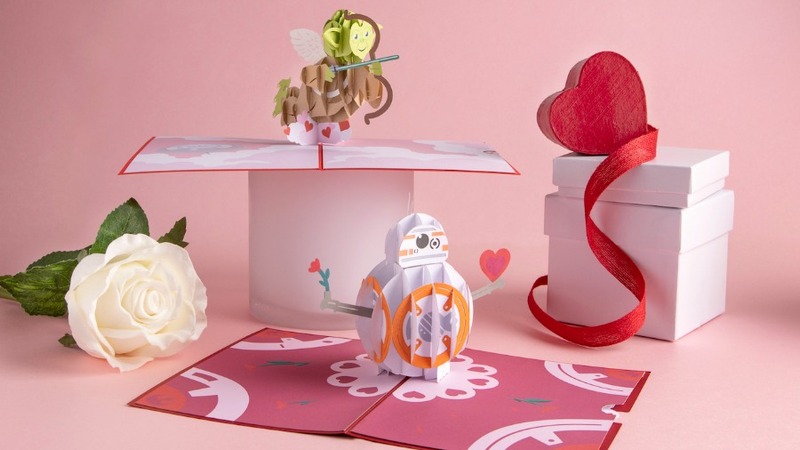 Tie it all together with a handcrafted pop-up card from Lovepop inside Marketplace Co-Op. Disney Springs offers some of the best collection of sweet treats you'll find on Walt Disney World property such as the classic Raspberry Chocolate Chip Cupcake topped with raspberry frosting from Sprinkles through March 3, 2019. On February 13 only, Sprinkles is offering a special “off the menu” Galentine’s cupcake. You can pick up a classic box of chocolates from Ghirardelli Soda Fountain and Ice Cream Shop in new heart-shaped box designs while Amorette’s Patisserie and The Ganachery are serving up special offerings for the occasion, too.